Job interviews can be stressful, and for good reason. Interviews have the potential to change careers and, by extension, lives, so nerves surrounding them are justifiable. With so much riding on job interviews every little thing matters, including first impressions. One of the best ways to make a positive first impression and get a job interview started on the right foot is to make sure you’re wearing an outfit that looks good and, more importantly, is appropriate for the situation. What you should wear to a job interview depends on a few crucial factors, factors which need to be taken into account together when deciding how to outfit one’s self for the big day. The obvious starting point is considering the kind of job that the interview is for. The first thing most people probably think of when imagining standard work attire is a suit, so it makes sense that a suit is the first instinct for most people when considering what to wear to an interview. Not all jobs and not all companies require such business formal attire, however, and overdressing can signal that you do not have a firm understanding of a company’s culture. While many companies and interviewers will inform potential job candidates about expected interview attire, that is not always a guarantee. In those instances a little detective work can be helpful, and using sites like Glassdoor or perusing the company’s website for photos of employees at work can be very helpful. While there is almost no situation where something as casual as jeans and a t-shirt is appropriate for a job interview, there are some places-like many tech companies-where the suit-and-tie finance look would be sorely out of place, making a more business casual outfit consisting of a button up and khakis more appropriate attire. Another consideration that people commonly overlook is the weather. In warm summer months a suit can get hot, and showing up to an interview with a shirt and face drenched in sweat is rarely a positive look. For more formal job interviews in these hotter times of the year consider skipping the jacket component of a suit while maintaining the professional shirt-and-tie look, or at the very least wait until entering the building to put on the jacket. A final item worth noting is that these tips and the circumstances where they are relevant differ for men and women. 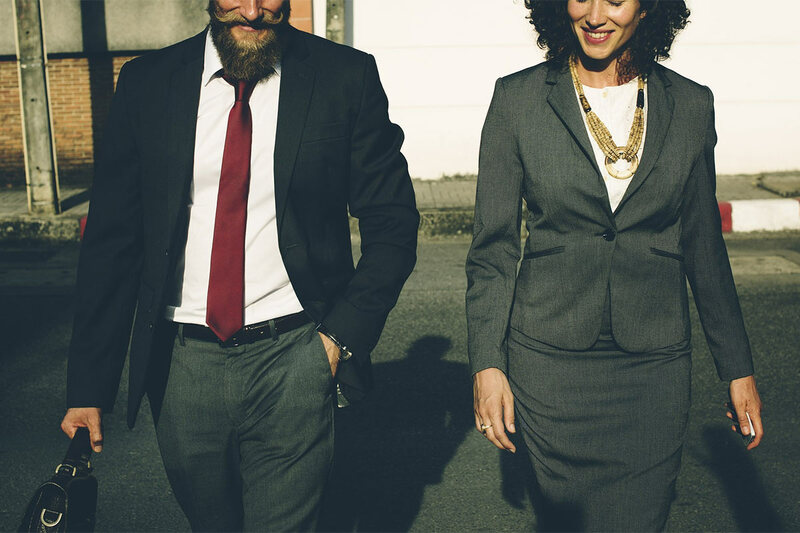 A recent survey found that women are 12% more likely than men to wear a suit to a job interview, which makes sense given the differences in suits and suit styles available to men and women. Women’s suits offer a more macro level of variety, including the the ability to choose between skirts or long pants. Women’s suits featuring the more breathable skirts allow for extra comfort for the wearer in hotter weather while still maintaining a highly professional look. Armed with these tips and considerations, anyone can make the right first impression no matter the position they are interviewing for. After that it’s up to them to keep the positive momentum going and get that job offer. Good luck!